I went to McDonald's this weekend with the kids. We go to McDonald's to eat about once a week because it is a mile from the house and has an indoor play area. Our normal routine is to walk in to McDonald's, stand in line, order, stand around waiting for the order, sit down, eat and play. On Sunday, this decades-old routine changed forever. When we walked in to McDonald's, an attractive woman in a suit greeted us and said, "Are you planning to visit the play area tonight?" The kids screamed, "Yeah!" "McDonald's has a new system that you can use to order your food right in the play area. Would you like to try it?" The kids screamed, "Yeah!" The woman walks us over to a pair of kiosks in the play area. She starts to show me how the kiosks work and the kids scream, "We want to do it!" So I pull up a chair and the kids stand on it while the (extremely patient) woman in a suit walks the kids through the screens. David ordered his food, Irena ordered her food, I ordered my food. It's a simple system. Then it was time to pay. Interestingly, the kiosk only took cash in the form of bills. So I fed my bills into the machine. Then you take a little plastic number to set on your table and type the number in. The transaction is complete. We sat down at a table. We put our number in the center of the table and waited. In about 10 seconds the kids screamed, "When is our food going to get here???" I said, "Let's count." In less than two minutes a woman in an apron put a tray with our food on the table, handed us our change, took the plastic number and left. You know what? It is a nice system. It works. It is much nicer than standing in line. The only improvement I would request is the ability to use a credit card. As nice as this system is, however, I think that it represents the tip of an iceberg that we do not understand. This iceberg is going to change the American economy in ways that are very hard to imagine. I got money in the morning from the ATM. I bought gas from an automated pump. I bought groceries at BJ's (a warehouse club) using an extremely well-designed self-service check out line. I bought some stuff for the house at Home Depot using their not-as-well-designed-as-BJ's self-service check out line. I bought my food at McDonald's at the kiosk, as described above. "Robotic Nation" is now available on the Kindle! All of these systems are very easy-to-use from a customer standpoint, they are fast, and they lower the cost of doing business and should therefore lead to lower prices. All of that is good, so these automated systems will proliferate rapidly. The problem is that these systems will also eliminate jobs in massive numbers. In fact, we are about to see a seismic shift in the American workforce. As a nation, we have no way to understand or handle the level of unemployment that we will see in our economy over the next several decades. Automated retail systems like ATMs, kiosks and self-service checkout lines marked the beginning of the robotic revolution. Over the course of fifteen years starting in 2001, these systems proliferated and evolved until nearly every retail transaction could be handled in an automated way. Five million jobs in the retail sector were lost as a result of these systems. 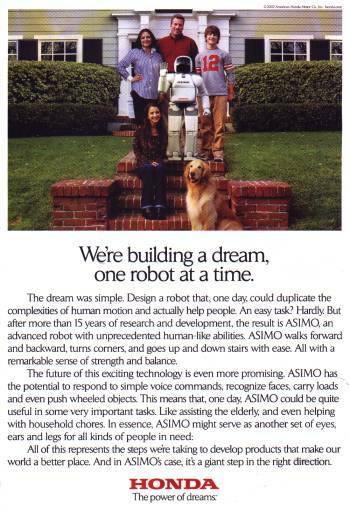 The next step was autonomous, humanoid robots. The mechanics of walking were not simple, but Honda had proven that those problems could be solved with the creation of its ASIMO robot at the turn of the century. Sony and other manufacturers followed Honda's lead. Over the course of two decades, engineers refined this hardware and the software controlling it to the point where they could create humanoid bodyforms with the grace and precision of a ballerina or the mass and sheer strength of the Incredible Hulk. Decades of research and development work on autonomous robotic intelligence finally started to pay off. By 2025, the first machines that could see, hear, move and manipulate objects at a level roughly equivalent to human beings were making their way from research labs into the marketplace. These robots could not "think" creatively like human beings, but that did not matter. Massive AI systems evolved rapidly and allowed machines to perform in ways that seemed very human. Humanoid robots soon cost less than the average car, and prices kept falling. A typical model had two arms, two legs and the normal human-type sensors like vision, hearing and touch. Power came from small, easily recharged fuel cells. The humanoid form was preferred, as opposed to something odd like R2-D2, because a humanoid shape fit easily into an environment designed around the human body. A humanoid robot could ride an escalator, climb stairs, drive a car, and so on without any trouble. Once the humanoid robot became a commodity item, robots began to move in and replace humans in the workplace in a significant way. The first wave of replacement began around 2030, starting with jobs in the fast food industry. Robots also filled janitorial and housekeeping positions in hotels, motels, malls, airports, amusement parks and so on. The economics of one of these humanoid robots made the decision to buy them almost automatic. In 2030 you could buy a humanoid robot for about $10,000. That robot could clean bathrooms, take out trash, wipe down tables, mop floors, sweep parking lots, mow grass and so on. One robot replaced three six-hour-a-day employees. The owner fired the three employees and in just four months the owner recovered the cost of the robot. The robot would last for many years and would happily work 24 hours a day. The robot also did a far better job -- for example, the bathrooms were absolutely spotless. It was impossible to pass up a deal like that, so corporations began buying armies of humanoid robots to replace human employees. The first completely robotic fast food restaurant opened in 2031. It had some rough edges, but by 2035 the rough edges were gone and by 2040 most restaurants were completely robotic. By 2055 the robots were everywhere. The changeover was that fast. It was a startling, amazing transformation and the whole thing happened in only 25 years or so starting in 2030. In 2055 the nation hit a big milestone -- over half of the American workforce was unemployed, and the number was still rising. Nearly every "normal" job that had been filled by a human being in 2001 was filled by a robot instead. At restaurants, robots did all the cooking, cleaning and order taking. At construction sites, robots did everything -- Robots poured the concrete, laid brick, built the home's frame, put in the windows and doors, sided the house, roofed it, plumbed it, wired it, hung the drywall, painted it, etc. At the airport, robots flew the planes, sold the tickets, moved the luggage, handled security, kept the building clean and managed air traffic control. At the hospital robots cared for the patients, cooked and delivered the food, cleaned everything and handled many of the administrative tasks. At the mall, stores were stocked, cleaned and clerked by robots. At the amusement park, hundreds of robots ran the rides, cleaned the park and sold the concessions. On the roads, robots drove all the cars and trucks. Companies like Fedex, UPS and the post office had huge numbers of robots instead of people sorting packages, driving trucks and making deliveries. By 2055 robots had taken over the workplace and there was no turning back. I know what you are thinking. You are thinking, "This is impossible -- there will not be humanoid robots in 2055. It is a ridiculous suggestion." But they will be here. Humanoid robots are as inevitable as airplanes. Imagine this. Imagine that you could travel back in time to the year 1900. Imagine that you stand on a soap box on a city street corner in 1900 and you say to the gathering crowd, "By 1955, people will be flying at supersonic speeds in sleek aircraft and traveling coast to coast in just a few hours." In 1900, it would have been insane to suggest that. In 1900, airplanes did not even exist. Orville and Wilbur did not make the first flight until 1903. The Model T Ford did not appear until 1909. Yet, by 1947, Chuck Yeager flew the X1 at supersonic speeds. In 1954, the B-52 bomber made its maiden flight. It took only 51 years to go from a rickety wooden airplane flying at 10 MPH, to a gigantic aluminum jet-powered Stratofortress carrying 70,000 pounds of bombs halfway around the world at 550 MPH. In 1958, Pan Am started non-stop jet flights between New York and Paris in the Boeing 707. In 1969, Americans set foot on the moon. It is unbelievable what engineers and corporations can accomplish in 50 or 60 short years. There were millions of people in 1900 who believed that humans would never fly. They were completely wrong. However, I don't think anyone in 1900 could imagine the B-52 happening in 54 years. Over the next 55 years, the same thing will happen to us with robots. In the process, the entire employment landscape in America will change. Here is why that will happen. One of the key capabilities limiting robotic expansion at the moment is image processing -- the ability of robots to look at a scene like a human does and detect all the objects in the scene. Without general, flexible vision algorthms, it is hard for a robot to do much. For example, it is hard for a blind robot to clean a bathroom or drive a car. Part of the problem is raw CPU power, but that problem will be solved over the next 20 to 30 years because of Moore's law. The other part is a software problem. We don't have really good algorithms yet. My prediction is that we will see significant progress in the image processing field over the next 20 years. Think about the changes that will take place once basic research in image processing yields the algorithms we need. Suddenly it will be easy for robots to walk around and manipulate objects in any human environment. Robotic cars and trucks are one obvious application for vision systems. There are more than 40,000 deaths in the U.S. every year because of car accidents. Human negligence causes most of these accidents. With robots doing all the driving, the number of accidents will go way down and we will eliminate one of the leading causes of death in the U.S. Unfortunately, robotic vehicles will also leave every taxi driver, bus driver, truck driver, etc. out of work. Robots with vision systems will be able to do all the cleaning in every hotel, store, airport and restaurant. Things will be spotless, but that will unemploy perhaps five million people. Robots with vision can stack brick, lay tile, paint and put on roofs all day and all night. Five million more people will be out of work. Robots with vision can easily stock shelves in stores. Think of all the workers stocking shelves, restocking merchandise, taking inventory, directing customers and manning cash resisters in places like Wal-Mart, K-Mart, Target, Home Depot, Lowes, BJ's, Sam's Club, Toys R Us, Sears, J.C. Penny's, Barnes and Noble, Borders, Best Buy, Circuit City, Office Max, Staples, Office Depot, Kroger's, Winn-Dixie, Pet Depot and on and on and on. More than 10 million employees will be on the street. Armies of robots with built-in night vision will be able to provide security and policing unlike anything we can imagine today. A single research area -- computer vision -- will have a tremendous impact once it reaches its goal of general, flexible image processing algorithms. This is analogous to the development of airplanes. Nothing happened in the field of aviation until the Wright Brothers made the breakthrough that got the first airplane off the ground. 44 short years after the breakthrough, supersonic flight was possible. Once robots have flexible, accurate vision systems, the pace of change will be unbelievably rapid and unstoppable. Tens of millions of people will become unemployed over the course of just two to three decades. In 1971, Intel released the 4004 microprocessor. It was a 4-bit chip running at 108 kilohertz. It had about 2,300 transistors. By today's standards it was extremely simple, but it was powerful enough to make one of the first electronic calculators possible. In 1981, IBM released the first IBM PC. The original PC was based on the Intel 8088 processor. The 8088 ran at 4.7 megahertz (43 times faster clock speed than the 4004) and had nearly 30,000 transistors (10 times more). In 1993, Intel released the first Pentium processor. This chip ran at 60 megahertz (13 times faster clock speed than the 8088) and had over three million transistors (10 times more). You can see that there are two trends that combine to make computer chips more and more powerful. First there is the increasing clock speed. If you take any chip and double its clock speed, then it can perform twice as many operations per second. Then there is the increasing number of transistors per chip. More transistors let you get more done per clock cycle. For example, with the 8088 processor it took approximately 80 clock cycles to multiply two 16-bit integers together. Today you can multiply two 32-bit floating point numbers every clock cycle. Some chips today even allow you to get more than one floating point operation done per clock cycle. The same thing happens with RAM chips and hard disk space. A 10 megabyte hard disk cost about $1,000 in 1982. Today you can buy a 250 gigabyte drive that is twice as fast for $350. Today's drive is 25,000 times bigger and costs one-third the price of the 1982 model because of Moore's law. In the same time period -- 1982 to 2002 -- standard RAM (Random Access Memory) available in a home machine has gone from 64 kilobytes to 128 megabytes -- it improved by of factor of 2,000. What if we simply extrapolate out, taking the idea that every 20 years things improve by a factor of 1,000 or 10,000? What we get is a machine in 2020 that has a processor running at something like 10 trillion operations per second. It has a terabyte of RAM and one or two petabytes of storage space (a petabyte is one quadrillion bytes). A machine with this kind of power is nearly incomprehensible -- there are only two or three machines on the planet with this kind of power today (the monstrous NEC Earth Simulator, with 5,000 separate processor chips working together, is one example). In 2020, every kid will be running their video games on a $500 machine that has that kind of power. What if we extrapolate another 20 years after that, to 2040? A typical home machine at that point will be 1,000 times faster than the 2020 machine. Human brains are thought to be able to process at a rate of approximately one quadrillion operations per second. A CPU in the 2040 time frame could have the processing power of a human brain, and it will cost $1,000. It will have a petabyte (one quadrillion bytes) of RAM. It will have one exabyte of storage space. An exabyte is 1,000 quadrillion bytes. That's what Moore's law predicts. Between 1981 and 2002, the processing power, hard disk space and RAM in a typical desktop computer increased dramatically because of Moore's Law. Extrapolating out to the years 2021 and 2041 shows a startling increase in computer power. The point where small, inexpensive computers have power approaching that of the human brain is just a few decades away. The computer power we will have in a home machine around 2050 will be utterly amazing. A typical home computer will have processing power and memory capacity that exceeds that of a human brain. What we will have in 2100 is anyone's guess. The power of a million human brains on the desktop? It is impossible to imagine, but not unlikely. The point is simple. In the 2050 time frame, you can expect to buy a $1,000 home computer that has the computing power and memory of the human brain. Manufacturers will marry that computer with a humanoid robotic chassis like ASIMO, a fuel cell and advanced AI software to create autonomous humanoid robots with startling capabilities. It is not really hard to imagine that we will have robots like C-3PO walking around and filling jobs as early as the 2030 time frame. What's missing from robots right now is brainpower, and by 2030 we will start to have more silicon brainpower than we know what to do with. Who will be the first large group of employees to be completely automated out of their jobs by robots? Chances are that it will be pilots. There are already robots in the cockpit: auto-pilots. We are rapidly coming to the point where airplanes can autonomously take off, fly to their destinations and land without human intervention. Airplanes use radar for their vision systems, and radar has been around for more than half a century. Pilots are prone to human error and they are incredibly expensive for the airlines. The elimination of pilots could happen as early as 2015. We have no way to understand what is coming or how it will affect us. Keep this fact in mind: the workplace of today is not really that much different from the workplace of 100 years ago. Humans do almost all of the work today, just like they did in 1900. A restaurant today is nearly identical to a restaurant in 1900. An airport, hotel or amusement park today is nearly identical to any airport, hotel or amusement park seen decades ago. Humans do nearly everything today in the workplace, just like they always have. That's because humans, unlike robots, can see, hear and understand language. Robots have never really competed with humans for real jobs because computers have never had the vision systems needed to drive cars, work in restaurants or deliver packages. All that will change very quickly by the middle of the 21st century. As CPU chips and memory systems finally reach parity with the human brain, and then surpass it, robots will be able to perform nearly any normal job that a human performs today. The self-service checkout lines that are springing up everywhere are the first sign of the trend. See Robots in 2015 for details. The problem, of course, is that all of these robots will eliminate a huge portion of the jobs currently held by human beings. For example, there are 3.5 million jobs in the fast food industry alone. Many of those will be lost to kiosks. Many more will be lost to robots that can flip burgers and clean bathrooms. Eventually they will all be lost. The only people who will still have jobs in the fast food industry will be the senior management team at corporate headquarters. The same sort of thing will happen in retail stores, hotels, airports, factories, construction sites, delivery companies and so on. All of these jobs will evaporate at approximately the same time, leaving all of those workers unemployed. The Post Office, FedEx and UPS together employed over a million workers in 2002. Once robots can drive the trucks and deliver the packages at a much lower cost than human workers can, those 1,000,000 or so employees will be out on the street. U.S. jobs by industry according to the 2000 Census. Nearly every construction job will go to a robot. That's about 6 million jobs lost. Nearly every manufacturing job will go to a robot. That's 16 million jobs lost. Nearly every transportation job will go to a robot. That's 3 million jobs lost. Many wholesale and retail jobs will go to robots. That's at least 15 million lost jobs. Nearly every hotel and restaurant job will go to a robot. That's 10 million jobs lost. If you add that all up, it's over 50 million jobs lost to robots. That is a conservative estimate. By 2050 or so, it is very likely that over half the jobs in the United States will be held by robots. All the people who are holding jobs like those today will be unemployed. Right now, a majority of people in America trade their labor for money, and then they use the money to participate in the economy. Our entire society is built around a simple equation: labor = money. This equation explains why any new labor-saving technology is disruptive -- it threatens a group of people with joblessness and welfare. Autonomous humanoid robots will take disruption to a whole new level. Once fully-autonomous, general-purpose humanoid robots are as easy to buy as an automobile, most people in the economy will not be able to make the labor = money trade anymore. They will have no way to earn money, and that means they end up homeless and on welfare. "Cities have lost patience, concentrating on getting the homeless out of sight. In New York City, where shelter space can't be created fast enough, Mayor Mike Bloomberg has proposed using old cruise ships for housing." This is not science fiction -- this is today's news. What we are talking about here are massive, government-controlled welfare dormitories keeping everyone who is unemployed "out of sight". Homelessness is increasing because millions of people are living on the edge. Millions of working adults and families are trying to make a living from millions of low-paying jobs at places like Wal-Mart and McDonald's. Most of those low-paying jobs are about to evaporate. With productivity growing at more than 2 percent a year, and the labor force growing about 1 percent a year, she said, the "hurdle rate" of growth for increasing the share of Americans with jobs cannot be less than 3 percent. The term "worker productivity" in this quote means "robots". We are seeing the tip of the iceberg right now, because robotic replacement of human workers in every employment sector is about to accelerate rapidly. Combine that with a powerful trend pushing high-paying IT jobs to India. Combine it with the rapid loss of call-center jobs to India. When the first wave of robots and offshore production cut in to the factory workforce in the 20th century, the slack was picked up by service sector jobs. Now we are about to see the combined loss of massive numbers of service-sector jobs, most of the remaining jobs in factories, and many white collar jobs, all at the same time. When a significant portion of the normal American population is permanently living in government welfare dormitories because of unemployment, what we will have is a third-world nation. These citizens will be imprisoned by unemployment in their own society. If you are an adult in America and you do not have a job, you are flat out of luck. That is how our economy is structured today -- you cannot live your life unless you have a job. Many people -- perhaps a majority of Americans -- will find themselves out of luck in the coming decades. The arrival of humanoid robots should be a cause for celebration. With the robots doing most of the work, it should be possible for everyone to go on perpetual vacation. Instead, robots will displace millions of employees, leaving them unable to find work and therefore destitute. I believe that it is time to start rethinking our economy and understanding how we will allow people to live their lives in a robotic nation.